1. First, teaching as a puppy. Puppies should be crated most of the time and when taken out is under strict supervision. Remember this is the learning stage, what you tolerate is what you are going to get. When you let your puppy out of the crate she should be following you. You are the pack leader, that means that the puppy is not going to be wondering around by herself and doing whatever she wants. She has to be beside you at all times and when not, should be on her place/bed. Teach your pup go into place when asked and the same for free command. With time you will raise a dog willing to please you as the pack leader. 2. Put “place” on cue. Teaching your dog to go to her place when asked. There are no exceptions, if you ask her to go to her place, she goes. This could be helpful when you have guests in the house or to interrupt any undesired behavior. 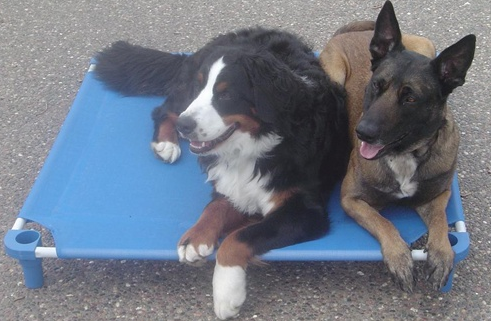 A solid “place” command is a must for your dog’s success. Remember to practice the place with all types of distractions so the dog is ready for any situation. 3. Locate the place/bed beside your bed. This is for owners that sleep with their dogs. One of the most important things that a dog needs to know is that nothing in life is free. They have to earn what they want and you as the owner are the judge of that. For your dog it would be a privilege to sleep in your bed so she has to earn it. And if you don’t feel like having her in bed, send her to the place/bed. Owners unconsiously bring the dog to bed whenever their dog asks and with time the dog is the owner of the bed. If not taken care of, this could turn into possession aggression and thats when you get growling if someone approaches the bed.